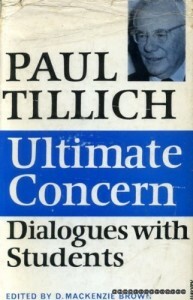 ‘ Faith‘, for Tillich was the state of being ultimately concerned. Everyone, he said, has an ultimate concern – that which they take for granted without thinking, something they would not surrender for anything. od, according to Tillich, is the ultimate ground of all being, beyond subject and–object. The only way of speaking of the ultimate is to use symbols. i) to relate existential questions to theological answers. The word ‘existential’ is from the Latin existere, which means to ‘stand out’ ; i.e. to stand out of not being. Existential questions deal directly with the questions of existence and what it means to exist. In one of-his. writings, ‘The Depth of Existence‘, Tillich compares a learned student with a simple manual worker. It is possible that the former may be existentially shallow while the latter may be existentially very much alive: ‘Look at the student who knows the content of the hundred most important books of the world history, and yet whose spiritual life remains as shallow as it ever was, or perhaps becomes even more superficial. Because he asks these questions, that man is on the way into depth, whereas the other man, the student of history, dwells on the surface among petrified bodies, brought out of the depth by some spiritual earthquake of the past. The simple worker may grasp truth, even though he cannot answer his questions; the learned scholar may possess no truth, even though he knows all the truths of the past.” In other words, the worker is asking existential questions. It is these questions that religion attempts to answer, according to Tillich, and not, definitely not, theoretical questions which may be settled on scientific, historical or other levels. The latter are preliminary questions not ultimate questions. ii) Tillich’s second task was to try, in a modest way to ‘heal’ the symbols which had become sick in our time. The present time, he thought, is marked by the erosion of symbols; they have lost much of their power because of changes at all levels of our life. For example, one of the major biblical images of God is that of ‘King’. Kings used to be the most powerful people on earth. It was natural that kingship should be used at some time as an image for the ultimate ground of The word “Lord” is kurios in Greek, and this is the name of Cyrus, king of Persia (‘the king of kings, and lord of lords’). Obviously, if there ever is a time when kings (small ‘s’) lose their power on earth, then this weakens the symbol of God as ‘King’ (capital ‘S’). This has happened to monarchies all over the world. So the ‘monarchical image of God loses its power. Tillich suggested different words and symbols for the old, familiar religious ones. For many people today, ‘God’ has whiskers on. People automatically think of a person ‘up’ there above the bright blue sky. Tillich used the phrase the ground of Being to avoid the idea that ‘God’ was a being. Similarly, he used the word estrangement instead of ‘sin’. To be in a state of ‘sin’, according to Tillich is to be stranger to yourself and the ground of your own life – ‘estranged’ – made a stranger. We have already seen how he used ultimate concern for.‘faith’. ‘Grace’ he called acceptance – simply accept the fact that you are accepted. ‘Christ’ he called the New Being who had overcome estrangement. And so on.